The latest in Aiaiai's line of headphones that mix design and performance, this time geared more towards producers than DJs with a more neutral and balanced sound signature. Bedroom producer, travelling musician, big city cool kid. 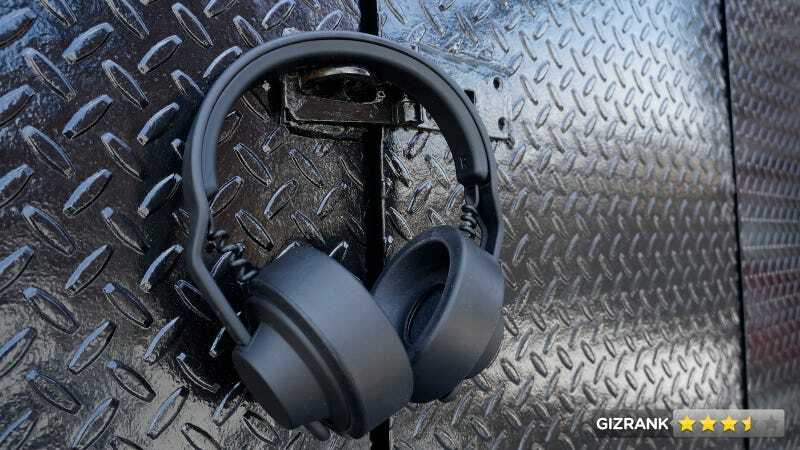 The headphones are virtually identical to the original TMA-1s: say retro-inspired, closed-back, plastic cans with a rubberized, black matte finish. But the Studios come with thicker headband padding and new PU foam earcups specially-engineered to hush out noise and extract more detail from tracks. The TMA-1s are sensitive enough to be driven by laptops or smartphones, but also respond to a little juice from an amp as well. The cups provide decent clamping force, but are comfortable enough to be worn continuously for several hours. The balanced sound signature means that little details—ones the TMA-1s couldn't quite pick up—come through quite well. Improved as the audio may be, the sound is a bit dark and hazy. It has always been the case with the TMA-1s, but those were a headphone designed first for DJs, who care more about bass than detail. Compared to Shure's SRH-940s, a similarly priced and spec'd headphone with a similar use case, the TMA-1 Studios couldn't deliver the same level of imaging and resolution. Bass response was still superior, however, which should be expected since these are geared towards electronic producers. Tested against the Aiaiai TMA-1 and the Shure SRH-940 headphones. Used a MacBook Pro and an iPhone 4S paired with a NuForce Icon iDo DAC/Headphone Amplifier. The foam cups don't feel flimsy, but I'm not sure I'd trust them to withstand the wear and tear of a daily commute and/or constantly being stashed in a bag without a carrying case. Used 320 Kbps audio files. Listened to Justin Bieber. Lots of Justin Bieber. If you're looking for a more balanced version of the TMA-1s, then yes. Granted the headphones are $50 more, but they deliver more detail through the mids and highs. That said, who care more about making records than making a visual impression may want to look elsewhere for a headphone that can accurately produce detail through the entire frequency range.